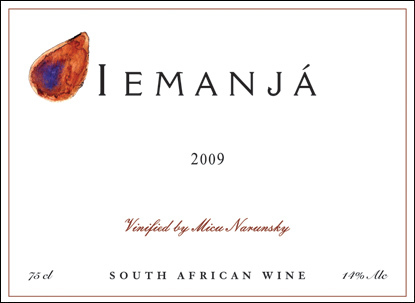 The flagship of Micu Narunsky Wines, Iemanjá (pronounced Yemanjá) is a unique red blend based on the Touriga Nacional grape variety, with Tinta Barroca in the supporting role (percentages vary from vintage to vintage). The grapes are sourced from the Swartland and Stellenbosch regions and are harvested at optimum ripeness. The wine is vinified in the traditional pigeage method, and much attention is devoted to every detail in the winemaking process. The 2006 and 2007 vintages are served at Aubergine restaurant in Cape Town and Buitenverwachting restaurant in Constantia respectively. The Iemanjá 2007 is exported to Sweden. The name of the wine was inspired by the legend of the African sea goddess Iemanjá. This legend was transported from Africa to the shores of South America via the slave trade of the 18th century. Today Iemanjá serves as a source of inspiration to many who believe in her powers; she is the sea, a protector of children and the essence of motherhood. Her centres of worship are in the Brazilian cities of Bahia and Rio de Janeiro. Portuguese explorers discovered both the Cape of Good Hope and Brazil, and by doing so created a cultural triangle; Portugal, Brazil and South Africa. 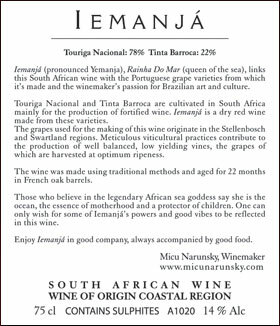 Iemanjá the wine, is a South African wine made from Portuguese grape varieties and reflects the winemaker’s interest and passion for Brazilian arts and culture. Iemanjá is a complex, elegant wine that can age for 10-12 years.